You must register your vehicle with the Department of Motor Vehicles if you are a resident of West Virginia. Application forms, relevant documents, and payment of fees must be submitted to have your vehicle processed. When you apply, it is possible to order special license plates. If you are a resident of West Virginia you can register your vehicle with the Department of Motor Vehicles (DMV). New residents have 30 days to register their vehicles. If you purchase a vehicle from a private dealer, you may be required to pick up temporary license plates to be able to drive on state roads legally. 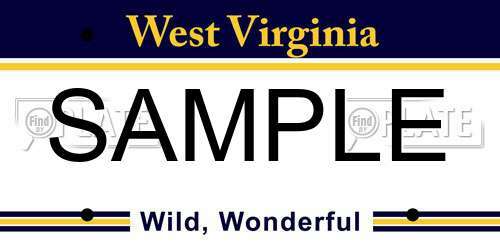 Applying for license plates in West Virginia can be done at a local DMV office. West Virginia’s standard issued license plate has a white, blue and yellow striped background with yellow and navy blue lettering. It also has “Wild, Wonderful” and “West Virginia” written on it. Most plates can be personalized with a custom plate number. After you receive your license plates, they must be secured to both the front and rear of your vehicle. Motorcycles only require a license palte on the rear. You will also receive decals which must be placed on the rear plate only. College License Plates. Commemorate and support universities, scholarships, sororities and fraternities. Special License Plates. Decorative and supportive plates for organizations, occupations, charities, nonprofits, and more. Military License Plates. Offering only to those who served in the U.S. military to remember their experience, awards, and service. Other License Plates. Special plates for older vehicles of a certain age. You must apply for these plates and show any required proof of eligibility (i.e. occupational plate require a copy of your employment). Vehicles providing transportation to people with disabilities. Placards must be clearly visible from within the vehicle. Both permit its owner to park in designated parking spaces in the community. Applications will be reviewed before being approved or rejected. The cost for registering personalized license plates vary by type. You are not permitted to transfer your license plates to a new person. If you no longer require your license plates, you should surrender them to a local DMV office. If your license plates are lost, worn out, damaged, or stolen, you can submit an application for replacements. It is possible to apply for replacements either online or in person. You may receive a notification that your license plates are soon to expire. It is your responsibility to renew your license plates prior to the expiration date found on the rear plate. After you have completed the renewal process (i.e. paid renewal fees) you will receive new decal stickers and remain valid for the duration of its time. Renewal fees vary by plate type and vehicle type. You should write your checks and process your money orders to the DMV accordingly. It is not advised to send cash in the mail. The fees above do not include state taxes, service fees, or any other additional fees required during registration. You can contact the DMV (800) 642-9066 if you have any questions for your vehicleès registration (i.e. fees, required documents, etc.). If you want to check for available plate numbers, use the search bar above. You can also use it to submit known license plates in West Virginia to obtain any submitted background information, like bad reports, vehicle history, and images.